Lentils grow abundantly in the province of Saskatchewan, so Regina might just become the new capital city for vegetarian chili! Lentil Chili: In skillet, heat oil over medium heat; cook onion, red pepper, jalapeno, chili powder, garlic, salt and pepper for 6 to 8 minutes or until vegetables soften. Stir in tomato paste; cook for 1 minute. Add lentils and tomatoes; bring to boil. Reduce heat to medium-low; simmer for 20 minutes or until thickened. 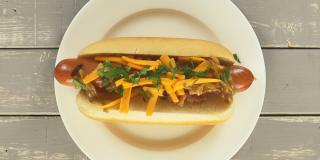 Grill veggie dogs according to package directions; assemble in toasted buns with cheese, green onions and Lentil Chili. 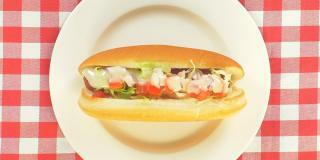 Tip: Substitute tofu dogs for veggie dogs if desired.